Tadcaster Albion manager Paul Marshall was resigned to missing out on this season’s title after dropping two points at home to Athersley Recreation on Saturday. Marshall’s side were unable to hold on to their first half lead given to them by Josh Greening’s 27th goal of the season as Athersley equalised with six minutes to go. Tadcaster’s blip now stretches back seven games to their 1-1 draw away with Highworth and they have since picked up just two points from their four league games. 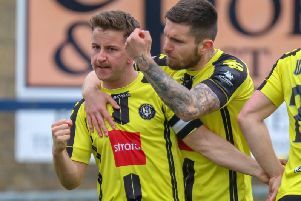 During that time, rivals Worksop have picked up 16 points out of 18 to replace Tadcaster at the league’s summit and Marshall admitted they are expected to clinch the title. He said: “We thought that it was a must win game and ultimately it should have been, we knew that the pressure was on but now everyone thinks that Shaw Lane or Worksop are going to win the league and they are going to have to cope with that. “It’s disappointing because winning the league was our ultimate goal for the season but we have still done tremendously well this season. But, that’s why it hurts a little bit more. “The game on Saturday was incredibly annoying because we had played really well but we are just not putting teams away, we are not scoring the goals that we were scoring earlier in the season. Albion’s squad have been given ten days off before their League Cup quarter final to ‘revitalise’ following their poor run of form. Marshall said his players were enjoying a ‘well deserved’ break before their trip to Lincoln Moorlands Railway on March 31 in what could be their last chance of silverwear for the season. Despite missing out on the FA Vase semi final and the County Cup final in recent weeks, Marshall was adamant that he would give the fans ‘something to cheer’ come the end of the season. He said: “All the lads deserve a break now. We decided that we weren’t going to train this week and we are giving the lads a 10 day break because I feel that they need it, it’s the right time to have a little break and I know they will come back stronger for it.